Natural Import Company - Traditional Japanese foods - Mitoku Donko Shiitake - 1.4 oz. Mitoku Donko Shiitake - 1.4 oz. Nami-Nami Donko Shiitake are the fine grade of the donko-family of Shiitake mushrooms. Donko gives Shiitake mushrooms their nickname as the "Miracle Mushroom." Mitoku Donko Shiitake can be used in gourmet dishes or used as a medicinal tea. 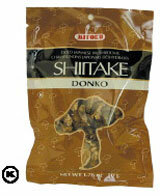 Ingredients: Japanese dried shiitake mushrooms (Fine Grade, Donko). Thick, Closed-caps.